Practically any writing class – or creative writing handbook – is going to tell you to make it your number one priority to always have a notebook with you. At all times. You never know when inspiration will strike (though having consulted with many fellow writers, that might be very inconveniently when you’re in the shower, or running for the bus….but you get the idea). Notebooks are, apparently, essential. As it happens, this notebook didn’t work for me. 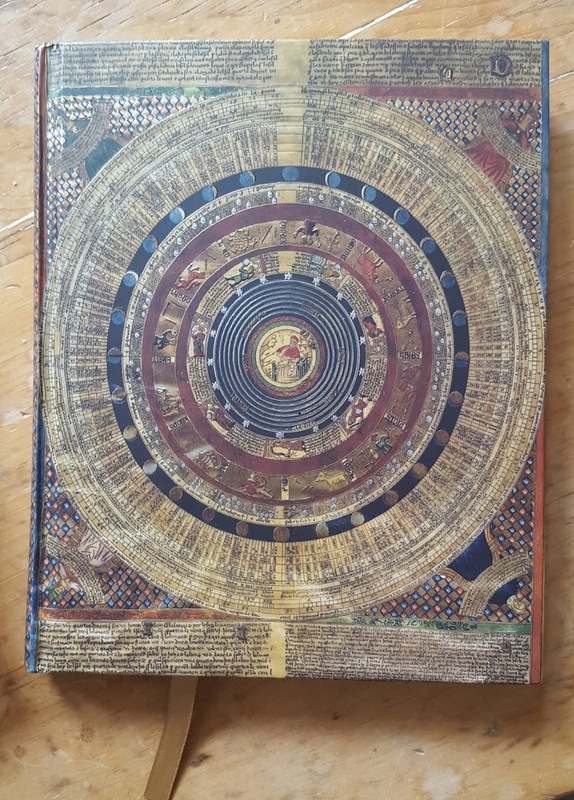 The cover is wonderful, but the pages are lined. It’s hard to ignore lines, but I find it even harder to keep within them...so sadly, it’s still only part used. A lot of writers go for the Moleskine - Hemingway’s favourite. It’s true it has handy pockets for tickets and memorabilia, all held in place with a strong elasticated band round the outside. You can choose your favourite size and colour (mostly red or black), and whether you want lined pages or not. Or a mix. They look great when shelved next to each other in a uniform collection. (shelving is another thing with writers, by the way. You can’t have enough bookshelves. Ever.) So all in all, the Moleskine sounds perfect, right? For many writers, yes – but it’s the very ‘specialness’ of these (they’re quite expensive) that makes me too scared to write anything in them. It’s okay if you’re like William Blake and can keep the same notebook for twenty years by writing things very small, and being fastidious. But that’s not me. Anyway, it got to a point where notebook experimentation meant I had so many notebooks, I didn’t know which one I was meant to be using for what. This confusion of notebooks meant I rarely wrote anything in any of them. Not having time to find the right one, I ended up almost always using my laptop. Meanwhile my room was littered with notebooks. One for recording dreams, one each for all my different book ideas, and separate notebooks for personal experience. Many of them are not even half full - some even less. Then something wonderful happened. Paul Magrs, novel writer and creative workshop leader, was asking for readers to give him feedback on a new creative writing handbook he’d written. I seized the opportunity, and offered to be a read The Novel Within You. (Hopefully this will be published very soon as it’s EXCELLENT! A wonderful mix of funny anecdotes, autobiography and extremely useful tips and ideas). Anyway, one thing Paul recommends, which really stood out for me, is the idea of a universal notebook. Write, draw, do what you like – but all in the SAME notebook – and make it cheap and practical so you’re not afraid to use it. Brilliant! Even before I’d finished reading the book, I found my ideal notebook in Wilkinsons. It’s cheap. It has a plastic cover, so I don’t have to worry about spilling stuff on it. It has a nice strong band to hold it together, so I can keep a pen tucked inside - and it adapts well to the interior of my bag (it takes a hardy notebook to withstand this nightmare environment). Not only that, the pages are plain and just the right texture. I now write everything in one notebook, which is always with me. I don’t have to be self-conscious about it, as no one will see it. To do lists, shopping lists, book ideas, whole chapters, blog ideas, notes from the evening course I’m doing – everything! And I fill them (repeat – FILL THEM!) at regular intervals. Tempted to match your photo with my array of nice notebooks, all empty save a page or too. I buy mine from the "cheap" shop in the local shopping centre - on the grounds that it doesn't matter if I tear pages out or they get battered to death. I would love a beautiful notebook but there is no point given my handwriting! I am not criticising anyone's notebook addiction - to each their own - but I've never really understood it. Partly for reasons given above - the cost and the multiplication of notebooks - but mostly because I've never felt the urge. If I have what I think is a good idea, I count on remembering it. If it's a good idea, I reason, it'll resurface in its own good time, perhaps bringing a friend with it. Then I have a plot. Otherwise, I scribble on old envelopes, backs of junk mail, old manuscripts - and chuck it when I've typed it up. Or I make notes in lots of different colours on my computer - this could happen - or that could happen - or this other thing. I move them up or down according to how workable they are, and join workable ideas together until I know where my story is going next. There must be others out there, surely, who don't use notebooks? Not me, I'm afraid, Sue - I agree with Lu, I just love notebooks! But mine have to be A5 size, spiral-bound, and LINED! (I can't cope with plain pages.) I have loads of them -most of them fairly cheap, because as you say, Lu, if they're too expensive and beautiful you feel you must save them for something really special, and you never know when you start jotting notes whether it's going to turn out to be special. I have a couple of these, which were presents from friends, and I love them but so far haven't written anything in them. Thank you, Lu, for a really interesting post. 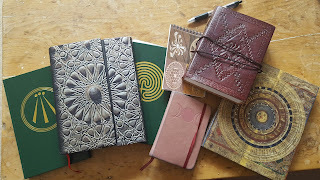 I too have a collection of half-used notebooks as well as some beautiful ones - often gifts - that I don't like to blight the pages with my untidy scribbles. Besides, such showy notebooks tend to be heavy and rigid too, which can make them slightly burdensome to carry around. 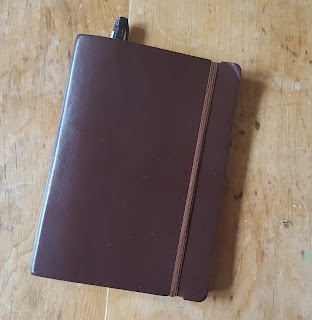 Recently, I've used wire-bound notebooks, tearing out the written-on pages and keeping the sections that might be useful, though I do have special journals for journeys. And I'm a great fan of Post-It notes for odd ideas - or any scrap of paper. I've kept scruffy spiral bound reporters notebooks for years, and a Filofax with interview jottings dating back to 1993. Early in a project, it's cheap and cheerful lined paper, or more likely the back of old printed A4 sheets. But there is a moment when a story needs its own beautiful notebook. My first precious one is overwritten and interwoven, a treasure trove of stolen sentences from favourite gurus and structural patterns that can be reworked over and over. A private aide memoire. So yeah, another stationary junkie here. Maybe it's a reaction to working for decades on screen when we really want a book in our hands. Penny, I LOVE post it notes! Had the entire plot of a novel in different colour post-its stuck on my wall at one point...then the notes kept curling and falling off the wall. Actually I never did finish that book, come to think of it...but remembering the joy of post-its makes me want to resurrect it! And Rowena, I went through a stage of a lovely notebook for each story, but it just didn't work out somehow. Basically everyone has to find their own personal notebook nirvana!